Encapsulating the years 1985 through 1925 in newsreel footage and scenes from slapstick comedies, Robert Youngson's 30 YEARS OF FUN is not as impressive as some of his other films, but is still a welcome addition to the historically important series of Youngson compilations. 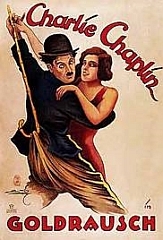 The heart of the film is made up of lengthy clips from four of Chaplin's classic films at Mutual (The Floorwalker, The Pawn Shop, Easy Street and The Rink) and two of Keaton's most surrealistic comedies (The Balloonatic and Daydreams). The Laurel and Hardy footage is hardly Laurel and Hardy footage at all, featuring only a few moments from their first meeting on film, Stan Laurel's solo comedy The Lucky Dog. Although this footage was a brand new find at the time and certainly worthy of inclusion in the film, for Youngson to use Laurel and Hardy's names so prominently in the advertising campaign was something of a bait and switch. 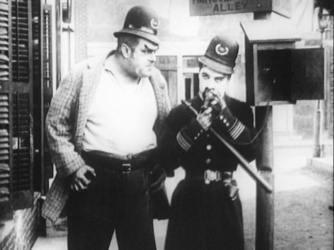 Late in the film, there is some fun footage of Babe Hardy as a policeman, already showing how well he had defined his delicate movements and wide array of facial expression several years before he had found the partner film fate had chosen for him.